I adore this series by Laini Taylor. 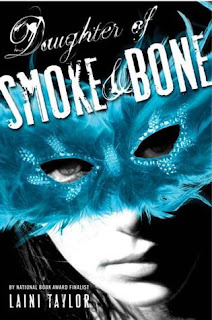 Daughter of Smoke and Bone is the first installment, and I just finished the second book, Days of Blood and Starlight. The third and final volume comes out this fall. I'm amazed by the perfection of the plotting, how deeply engaging it is, and the fine literary details. It's become my favorite fantasy world aside by from the incomparable Middle Earth and Narnia.